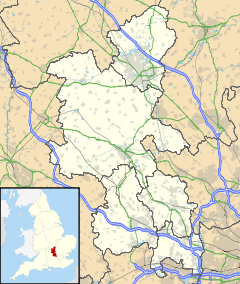 Elmhurst is a neighbourhood in north Aylesbury in Buckinghamshire, England. It occupies the area to the north and south of Elmhurst Road, now a section of the town's ring road. Elmhurst is mainly residential, and has a very small shopping area on Dunsham Lane and another next to the Buckingham Road junction. Most of the housing consists of terraced council housing and blocks of low-rise flats. Elmhurst has two state schools, The Elmhurst School, on Dunsham Lane situated next to the Alfred Rose Park, and St Louis Catholic Combined School, located on the edge of the estate near Bierton Road. Following an Ofsted report in October 2018, the school was placed into special measures in December 2018. The school was found inadequate in several areas, specifically leadership, quality of teaching, lack of attainment of pupils, and poor pupil behaviour. St Louis Catholic Combined School is a voluntary aided Roman Catholic primary school in Aylesbury, Buckinghamshire. It is a coeducational school which takes children from the age of 4 through to the age of 11 and has 238 pupils. It was founded in 1945 by a group of French nuns of the Sisters of St Louis order. ^ a b "St Louis Catholic Primary School - GOV.UK". www.compare-school-performance.service.gov.uk. Retrieved 27 February 2017. ^ "Our History". www.stlouisrccschool.co.uk. Retrieved 27 February 2017. This page was last edited on 18 December 2018, at 23:08 (UTC).